How would you define content marketing in the year 2019? Here’s an overview from Marketing 360®. We’ll start this post with an admission. It’s just about impossible to have a finite, exact definition of the tactic of content marketing in 2019. Both content and marketing are too broad in meaning and impact. Yet content marketing is a tactic every business will execute, whether they plan to or not. If you need to persuade someone to take a certain action, you’re marketing. If you’re online using blog, website, video and social media platforms, you’re creating content. 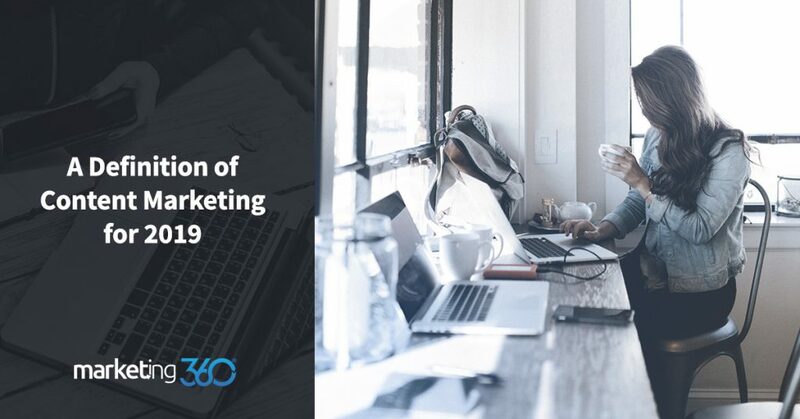 Here’s an overview of what content marketing looks like for SMBs in 2019. We may not be able to provide an exact definition, but we can give you a sense of direction for this important marketing tactic. Let’s start with content. Content is not just blog posts or white papers. It’s not promotional videos that are at least 2 minutes long. It’s not just a call to action or value proposition. In 2019, content is literally any material you use to market your business. Your business card is content. Your About Us and Contact Us website pages are content. Anything that shows up on search about you is content. What you tell a stranger at a coffee shop about your business is content. In fact, some of the most influential content for your business isn’t even something you generate. It’s reviews written by your customers. This content has a major impact on your sales and lead generation, and it’s only partially under your control. If you create a piece of collateral designed to influence your audience, it’s part of your content strategy. Then there is marketing. Today, marketing is any activity you engage in that has the purpose of persuading people that your offer has value. Marketing and persuasion are virtually synonymous. If you run for mayor in your town, you’re marketing. If you’re trying to convince your teacher to bump your grade from a B to an A, you’re marketing. If you post an Instagram selfie that you think really shows who you are, you’re marketing. One important qualification for business marketing is that it targets a demographic and/or psychographic. There is a group of people with shared characteristics you’re trying to persuade. But at the same time, as individuals move through your sales funnel, you personalize their journey as much a possible. Some business will say they don’t do any marketing. That’s hogwash. Everyone markets today. What they probably mean is that they don’t pay to run direct response advertisements. That type of advertising is different, yet when you target online consumers paid ads usually become part of your marketing funnel. Anything you do that exposes people to your brand and makes a memorable impression is marketing. Content marketing is ubiquitous in 2019. Our culture is driven by marketers. It’s not hard to figure out what’s changed things so dramatically in the last decade. The internet, and in particular social media, altered traditional marketing. Today we’re all our own one-person broadcasting stations. Likewise, we can follow brand stories in ways that were impossible a decade ago. Businesses used to rely on the Yellow Pages and verbal referrals. Today, advertising and word of mouth are digitally amplified. It’s changed the game. With today’s multichannel content marketing, you can’t just run an advertisement to save 20%. You need a story to tell. Take your value proposition and think about how you can exemplify it through anecdotes and real-life examples. Personalize your story, particularly on social media. Read a case study on how an eCommerce business built their brand on social media. Also, consider how you can provide useful information. One of the most effective types of business content marketing is finding an informational niche. When your prospective customers have informational gaps you can fill, it gives you the chance to educate them and build trust. This type of content is also useful for nurturing leads through your sales funnel. Read a case study on using informational content to gain SEO results. Also, consider the ways in which your brand fits into people’s lifestyles. The content people are most eager to consume is stuff that both fits their lifestyle or – more often – the one they aspire to. Because of the fluid, multichannel nature of digital content, you need a theme that keeps your ideas consistent. Let’s reconsider the admission we started with. Maybe there is a way to define content marketing in 2019. Content marketing: the act of creating, promoting and distributing content in a way that gets people to remember your brand. If that doesn’t quite work as a definition, it certainly works as a goal. With content marketing, whether you’re eCommerce site targeting a national audience or local service provider, the underlying goal is to get your brand in front of people in a memorable way. You want them to understand the value you offer so when the moment of truth comes and they’re ready to spend money, they’ll remember you. Our data bears this conclusion out. We market for thousands of businesses of all types, and in 2018 we found the search keyword for both organic and paid search that delivered the most results was the business or brand name itself. For most businesses, a type of marketing takes place that introduces people to their brand. They’ve interacted with some type of content online. That content educated them, entertained them, and won their trust. Now the time has come to buy or hire. Because of content marketing, they already have a strong idea of who they want to work with, so they look them up by name. Content marketing is fully aligned with our digital lives in 2019. In a sense, you can think of it as kind of transcendent billboard that integrates itself into people’s online activities. At first, they may just kind of glance at it. But if you capture their interest and connect with their lifestyle, you’ll gain interest that’s fortified by repetition, like driving by the same billboard day after day. Only this digital billboard is a constant state of transformation, always improving and delving further into people’s interests. Is content marketing part of your strategy for 2019? We’d argue that you have no choice. It is. The question is how effective your execution will be, and how much business growth will you experience from the results.